We initially wrote off Therme Bucharest as just another pool. 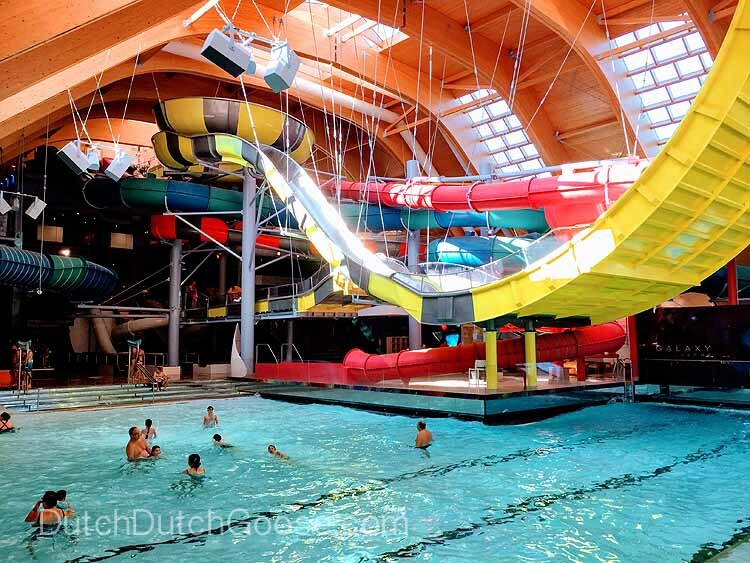 We figured that after the spa time in Budapest we would be done with swimming but as we grew weary of being in the city of Bucharest Therme popped back onto our radar as a family retreat. It was fun but we had some disappointments. The pricing scheme at Therme is needlessly complicated. There are three zones each with a different price. You can get a 3 hour, 4.5 hour or 1 day pass. Your time starts when your bracelet is activated by the front desk and stops when they scan it for you to pay. This means that your changing time is included in your time inside the park. I wonder how many people throw on their clothes and race out just in time so they’re not charged more! The good news is that each additional hour you stay only costs a few extra Euro and you never pay more than a full day’s fare. In small letters at the bottom of the pricing page (so basically hidden) they also mention that there is an up-charge for a weekend visit. I wish they would just include this in their pricing charge instead of hiding it. You can rent towels, robes and flipflops if you didn’t bring them with you. It is best to look online and know what you want before you arrive. It seems even more confusing when you are standing at the desk. We opted for just the Galaxy area (the kid-friendly area) for 3 hours. This turned out to be just the right amount of time for my little ones. The Galaxy area is the family-friendly area of Therme. It was billed as having waterslides for all ages, a splash pad, a wave pool, pool bar, sandy beach and a relaxation area. Most of the waterslides were limited to 12 and over. Jeff and I took turns trying the big slides that were open. Several of the slides were closed, despite it not being listed on the online maintenance calendar. There was an area for little kids that had a racer slide and one smaller slide. These were perfect for the Big and Middle Little to do on there own. The next set of six slides were for age 6 and up, but the Big Little (5 1/2) was able to use these without an issue. He is a strong swimmer and not scared of water in his face so we felt comfortable allowing him to use these. We waited at the bottom while he did these slides over and over. The warmest of the pools was this pool bar in the relaxation area. They have a number of alcoholic and non-alcoholic drinks and plenty of in-water seats and tables. We did not order a drink, but most everyone else had one and they all looked good. The kids loved that this pool was “hidden” by the orchids and trees. There were three saunas in this area that were for 12 and over. I popped into each while Jeff sat with the kids. They were all very nice. The rain forest one in the center was my favorite. They all had faucets to rinse off the seats with cool water which is weirdly refreshing! These hydro beds were an additional cost but full the entire time we were there. We didn’t try them out but they seemed like a combo water bed and chair massage. They must have been good though. Infrared saunas are all the rage here it seems since we’ve been seeing them everywhere. Therme had a whole set of Infrared beds you could enjoy for free. There were plenty of lounge chairs and other seating throughout our section of the spa. I’m sure when it is crowded it feels crowded, but the place was mostly empty for our visit so we were able to spread out. They also have hangers for towels that blow hot air from the bottom, so your towel can always be hot and dry. The water temperature was perfect – we never felt cold. We grabbed lunch while visiting and were shocked to find amazing food. The selection was healthy and tasty. They even had a few highchairs which was perfect. Ah the outdoor pools. We did not have a chance to test them out since they were not open during our visit. We were told at check-in that they were currently closed but would open in no more than 20 min. Over the next hour every time we asked about the things that were not open we were told “20 min.” An hour and a half into our visit they put up tape over all of these pools and slides and we figured they weren’t going to open at all. At the end of the day about a third of the pools/slides weren’t open during our visit. At checkout we asked for a partial refund since we were told everything would be open. They were unable to figure out how to refund us and instead issued us a pass to come back within the next 30 days. We were unable to use the pass since we were not going to come back and try it again! Therme Bucharest is aware of the dishonest taxi drivers in Bucharest and has a virtual taxi stand in the lobby. You push what price and level taxi you would like (economy, moderate, luxury) and it prints you a receipt and calls you a cab. Do not turn this ticket over to the taxi driver. Ours tried to take ours and throw it away. (I had taken a photo of the receipt.) The driver typed in a completely different rate code (nearly twice what our receipt said) to take us back to our hotel. When we returned to the hotel we were able to use the photo to pay the promised rate that was indeed printed on our receipt from the virtual taxi stand machine. Overall I think Therme is a great way to spend a few hours in Bucharest. As with most things we encountered in Bucharest the polish is missing. Therme’s facilities are lovely but Therme could enhance the user experience by simplifying the payment and being upfront about charges.